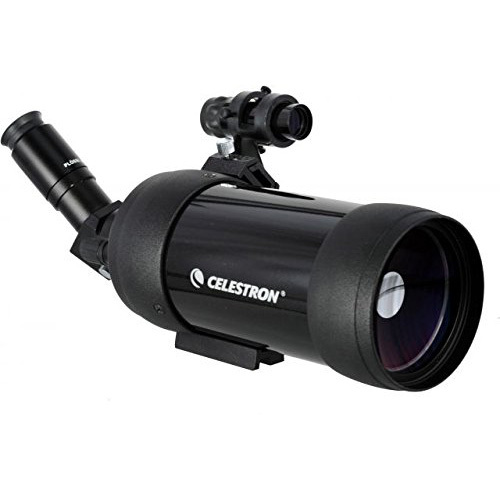 Welcome to our review of the Celestron 39-100×90 Maksutov Spotting Scope. This spotting scope is a bit of an odd bird, using the rare Maksutov-Cassegrain catadioptric design. If you don’t know what those words mean, don’t fret. Just click the links to our glossary to find out more about them. The C-90 MAK, as its commonly called, features a large 90mm objective lens and an angled eyepiece. It also comes equipped with a finder scope, which is very nice for locating your target before you zoom in on it. The scope’s eye relief is a very comfortable 20mm, making the glass easy to use with or without eyeglasses. One drawback of any spotting scope this powerful is its size. You’ll find the C90 MAK weighs in at a full five pounds, and measures 16 inches long. It’s not terribly heavy, but you’ll definitely know you’re carrying something when you use the included backpack. Other than the tripod, the included accessories are all very fine quality. The tripod, as per normal, is pretty much a piece of junk. It is wobbly and the altitude knob strips easily under the weight of the scope. I strongly recommend purchasing a heavy duty tripod to use along with your glass. What’s the Magnification of the C90 MAK? With its 90mm objective lens and the included eyepieces, you can adjust magnification on this spotting scope from 39X to 100X. That’s quite a range of magnifications, and allows you to quite easily read the individual letters on a license plate a mile away, assuming the weather conditions are good. 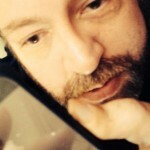 There aren’t any signs of chromatic aberration in the image. Everything is crisp, clear, and full of contrast. The 8 to 24mm eyepiece does have a bit dimmer an image than the 32mm eyepiece, but not by much. One drawback to this model is a short field of view. At maximum magnification, you’ll only be able to see about 68 feet of terrain from 1,000 yards. Near focus, on the other hand, is quite good. You’ll be able to zoom in on objects just 15 feet away. How Easy is the Glass to Use? If you’re accustomed to more traditional spotting scopes, there will be a slight learning curve to use the C90 Mak. This is because the focusing mechanism works a bit differently, moving the primary mirror back and forth on the primary baffle tube. The focus knob is located at the rear of the primary tube and to the right, just beside the eyepiece assembly. The knob is large and textured well enough to be easily used with or without gloves. The 32mm eyepiece doesn’t offer any variable magnification, but the 8 to 24mm eyepiece that is also included does let you zoom back and forth. The magnification wheel on this eyepiece is very easy to use. This all depends on which eyepiece you use. The 32mm eyepiece is only multicoated, which cuts down a small bit on the spotting scope’s transmittance. On the other hand, the smaller diameter of the 8 to 24mm eyepiece allows less light transmission, but almost makes up for this deficiency by featuring fully multicoated optics. The scope’s twilight factor isn’t provided, but this spotting scope is designed for backyard and amateur astronomy, so it’s quite good. I’ve been able to view the moon, of course, as well as Jupiter, Saturn, and even the Galilean moons of the gas giant Jupiter. How Are the Optics and Focus on This Model? As previously stated, this uses a very different design than most spotting scopes. There are no prisms utilized, meaning no worry about phase shift and no need for phase correction coating. Even though the optics are only multicoated and not fully multicoated, they are still excellent quality. Focus is sharp and easy, although the finderscope can be a bit of a challenge to calibrate and focus. The focus knob for the primary mirror is easy to use, offering just enough friction to prevent you from bumping it, but still keeping it smooth and easy to operate. Make no mistake, while this is a short scope lengthwise, it’s still a monster. The all-metal design coupled with the unit’s sheer size and weight make the C90 MAK almost impossible to use handheld. I suppose you could pull it off, especially if you have large hands, but even that is sketchy. Use the included tripod until you get a better one, then just make sure you carry your tripod along with you to get the most out of the scope. How Durable is the C90 MAK? nitrogen-purged, so the scope is neither fogproof nor waterproof. Additionally, the lack of any rubber armor on the housing means the scope doesn’t really offer you any shock absorption. Celestron’s idea of the main usage for this spotting scope isn’t going into the rugged outdoors to view wildlife. Rather, it seems to be designed for backyard stargazing, viewing wildlife on pleasant days, and use at the shooting range. With that said, the included backpack does offer some padding to protect the C90 MAK when you’re walking or hiking to your favorite wildlife viewing area. Thanks for reading my review of the Celestron 39-100x90 Maksutov Spotting Scope. This rather unique model offers plenty of usability, but it doesn’t provide the ruggedness that some of our more popular spotting scopes will offer you. Still, it’s a great choice for amateur or backyard astronomy, as well as for spotting bullet holes from 300 yards away or more.